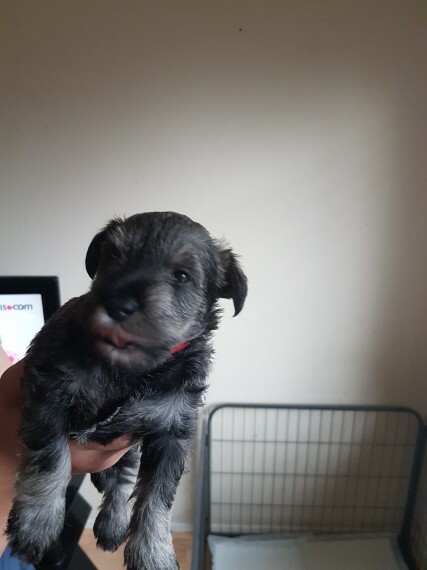 have 3 georgous minature Schnauzers for sale, all are salt and pepper. We have 2 girls and 1 boy, mum is kc registered, dad's is not but has champions in his blood line as does mum. Mum and dad are both family dogs and can be seen, boy and girls are 900.we have all paperwork for both mum and dad available to be seen. Deposit is 100 non refundable unless health problems picked up at 7week 6 day check, they will be chipped and 1st vac, they also come with 4 weeks insurance. All puppies have been wormed.